Don't get too excited about these Dow Jones stocks. Politics played a role in many of their advances. 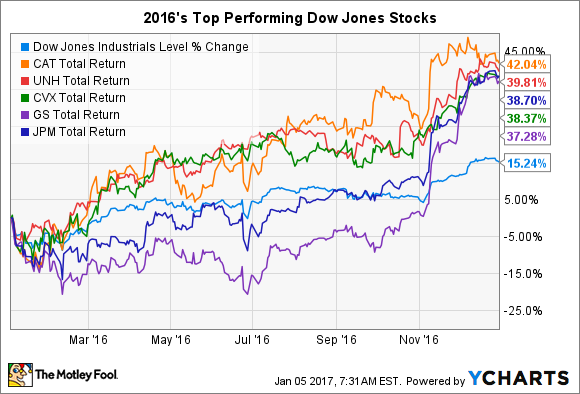 Compared against historical standards, 2016 was a better-than-average year for the Dow Jones Industrials (DJINDICES:^DJI), which advanced 15% on the year. But a select few did lots of the heavy lifting for the index, helping it gain over 2,330 points. Two energy and materials companies -- Caterpillar (NYSE:CAT) and Chevron (NYSE:CVX) -- joined two banks -- Goldman Sachs (NYSE:GS) and JPMorgan Chase (NYSE:JPM) -- as four of the top five Dow Jones stocks of 2016. United Healthcare (NYSE:UNH) rounded out the list of this year's top performers. If we dig a little deeper, we can easily see that both Goldman Sachs and JPMorgan -- while not having awful years before the presidential election -- saw huge swings in their fortunes after the election of Donald Trump as the country's next president. In fact, between Election Day and the end of the year, Goldman Sachs and JPMorgan saw their stocks advance 34% and 24%, respectively. Investors should be careful about reading too much into these moves since the companies themselves reported no substantial news to warrant such advances. Instead, investors viewed the election of Trump as a sign that regulations might be eased on large banks, and that interest rates would finally move upwards after years at near-historic low levels. While only time will tell if the former comes to fruition, the latter has already begun in earnest, with the Federal Reserve deciding to raise interest rates in December. While the banks' advances were political in nature, Caterpillar and Chevron had been trending upwards for most of the year -- though they too benefited from the post-election bump. Chevron suffered its first quarterly loss in over a decade earlier in the year, and things weren't looking too bright when the price of a barrel of crude oil fell below $30 in February. But since then, the landscape has shifted -- albeit slightly. The company's cost-cutting measures and restrained capital spending, combined with the fact that oil jumped to over $50 per barrel, helped it return to profitability by the end of the third quarter. Caterpillar was buoyed by optimism throughout the year, but as fellow Fool Daniel Miller has shown, it's difficult to understand why. Energy, transportation, and machine retail divisions at the company are continuing to show weaknesses. The company has a large employee benefit payment coming due in 2017, and management has openly said that analyst estimates for the year are overly optimistic. Rising energy prices are likely helping the company, as well as its current dividend yield of 3.3%. What will healthcare look like? Finally, we have UnitedHealth. The company has already announced it would be leaving most of the states where it was offering individual coverage under the Affordable Care Act, but the election of Trump -- and his promise to make serious changes to the law -- may make the point moot. Even without the Affordable Care Act, UNH is easily the largest health insurer in the country, with over 48 million individuals enrolled with the company. That's a big deal, because it gives UNH bargaining power with healthcare providers to lower prices, which makes its ecosystem even more appealing for those seeking health insurance. During 2016, the growth of the company's Optum division was the real star. While growth rates in the division -- especially OptumRx -- may have slowed, it still provides the best margins in the business. Looking ahead to 2017, I caution investors not to read too much into these gains. Advances by banks and healthcare companies were predicated on assumed changes in how our government approaches these industries -- which can be blind optimism at best. And while it's hard to envision a future where oil and energy prices don't eventually rise, no one knows which direction those prices will head either. My main point: Forces that these companies have little control over could be huge catalysts in 2017 and beyond. Stay diversified and stay invested so you can roll with the punches over time.